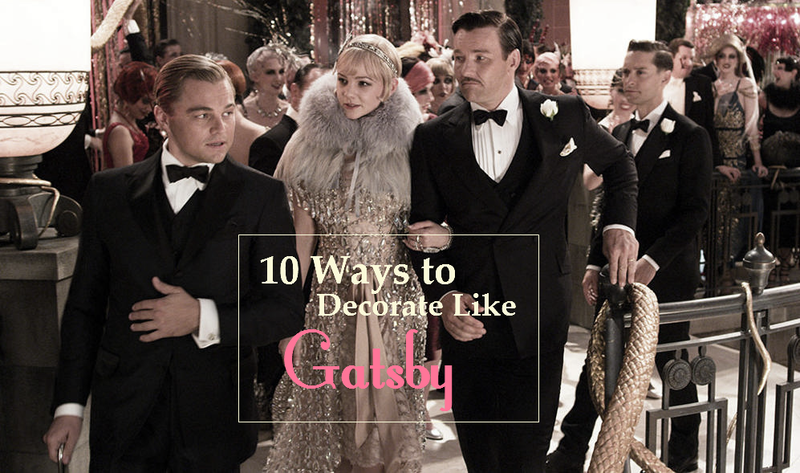 Gatsby is the buzzword again for 2014 in the design world, thanks to the success of Baz Luhrmann’s extravagant adaptation last year starring Leonardo di Caprio and Carey Mulligan. The lavish mansions of Jay Gatsby and the Buchanans may be a little out of most of our price ranges but you can still get that fabulous art deco look with a few twists and updates, in one room or the whole house. Stick to black, white and metallics wherever possible in textiles like upholstery and comforters but add unexpected pops of color with fuschia, turquoise or the butter yellow of Gatsby’s infamous car. You’d be surprised by the impact you can achieve against a dark, neutral background with only a couple of pillows, a single semi- or high-gloss painted wall or even a few lampshades. Collect vintage art deco items from antique stores like clocks, lamps and end tables. Fill simple squared silver or black frames with prints by artists like Tamara de Lempicka and Aaron Douglas. Bring in chrome elements such as towel racks, drawer pulls and doorknobs for a sleek, elegant consistency. Take your curtain cues from elaborately decorated flapper dresses by swapping out solid color panel curtains for a few with sparkly accents such as strips of sequins or even a crystal beaded curtain behind black sheers. Mirrors reflect the opulence and grandeur of the glittering 1920s (plus, they make any room look larger!) Pick up a few flat mirrors in standard sizes and pair with polished silver frames. Cover stair risers with art deco patterned wallpaper for a stylish and stunning statement. Collect champagne bottles and dress them up with funky colored or metallic glass paint or even glitter, with this fabulous tutorial from I Wore Yoga Pants! Fill with white spray roses, green Bells of Ireland, or ostrich feathers and line up on the mantelpiece or coffee table. Spray paint wooden thrift store finds and simplistic Ikea products, then dress up with art deco hardware. For inspiration, check out this epic Ikea hack at My DIY Habits. Instead of stashing the “giggle water,” (a particularly amusing 1920s slang for alcohol, in case you were wondering), in a cupboard somewhere, develop a functional and sophisticated cocktail corner with a vintage decanter, a few essentials, a few splurges and the perfect bar cart. Need helping stocking this fabulous new bar cart? Elsie at A Beautiful Mess has all the answers for you in her brand new guide!